Baltimore ‘Hon’ – David J. Puglia, Ph.D.
Baltimoreans have garnered a reputation for greeting one another by tagging “hon” to their speech. In the late twentieth and early twenty-first century, this small piece of local dialect took center stage in a series of rancorous public debates over the identity associated with Baltimore culture. Each time, controversy followed leading to consequences ranging from protests and boycotts to formal legislative action. “Hon” brought into focus Baltimore’s past and future by symbolizing lingering divisions of race, class, gender, and belonging in the midst of campaigns to unify and modernize the city. While some decried “hon” and “the Hon” as embarrassing, others hailed the word and the related image of a down-to-earth, blue-collar woman as emblematic of the authentic Baltimorean. 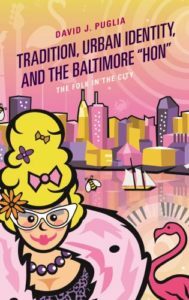 This book tells the story of the battles that flared over the attempts to use “hon” to construct a citywide local tradition and their consequences for the future of local culture in the United States. This is a well-researched book that examines place-making practices in a metropolitan environment. Puglia expertly traces how in Baltimore, the word ‘hon’ moved from a stigmatized to an esteemed vernacular for purposes of collective civic representation and the controversies such a move engendered. In doing so he adeptly explores important issues of class, identity, representation, commodification and the privatization of folklore. It is an excellent case study of the processes of the selection and invention of tradition in a city that deserves more attention to its folk traditions. This entry is licensed under a Creative Commons Attribution-NonCommercial-NoDerivatives 4.0 International license.